Listen here. Use headphones if you're in public! Haven't listened to it yet, but kudos to whoever came up with the episode title. Credit where credit is due - that came from Julie Benson. I'm about an hour in, and felt I needed to post this. One of the real under-rated parts of Sal's appearances (and that I completely get a kick out of) are his off the cuff, rapid fire, completely out-dated, cultural references. I'm only 30 minutes in, but, so far, I've marked off "Cindy Crawford," "Charles Bronson," and "Oui Magazine" on my "Uncle Sal Bingo Card." Ah, an Uncle Sal episode! AWESOME! Yeah, he does repeat himself from previous episodes a bit, but there's also some new material thrown in (Cindy Crawford, Cheryl Ladd, new insights into his mom and daughter, etc.). Interesting to hear that he's not as close to Buzz or Simone as he used to be. The Suntres interlude was pretty funny! And sorry to hear about the loss of the Huggy Wipes. I also think this is the first time Sal decided to sign off before you guys said time was up. Haha! Pants and Letterman, yeah, he did get a little excited. LOL! Ah, an Uncle Sal episode! AWESOME! Yeah, he does repeat himself from previous episodes a bit, but there's also some new material thrown in (Cindy Crawford, Cheryl Ladd, new insights into his mom and daughter, etc.). Ps- The bit with his mom blaming the Japanese for everything is some of his funniest stuff ever. My favorite reference was Nova from Planet of the Apes. You have good taste Sal! I just want to hear the audio from Uncle Sal and Murd on a long car ride. I can't imagine two more different people sharing the same space. True, but I think Sal does his schtick (sic) for entertainment's sake. When I meet him at cons he can talk serious like the rest of us especially if your talking comics. So I think he and Murd could have a good discussion about old comics, but I don't think they'd be discussing the intricate details of Crisis or anything. Also, I think Murd has learned to keep mostly quiet during Sal's "interviews." I think the most involved I've ever heard him with Sal was when they (Sal, Peter, Pants, Murd) were discussing if the single guys would ever get married and Murd said something like "I don't see it happening" and Sal said "Well, really you don't have control over it..." like it's a random event and then went on to tell the story of how he met his wife at the Alex Ross party. Then Murd summed up by saying something like "So, what you're saying is I'm up the creek without a paddle.." while Peter and Pants were laughing in the background. Can't even imagine how fun it would be to be out at a bar with Sal. True, but I think Sal does his schtick (sic) for entertainment's sake. Oh, undoubtedly. I'm sure he's a different guy when he's representing Alex Ross or at home with his family. But my point is that, even though I don't know Murd personally, from what I've learned about his personality on the podcast, I'm not sure how entertained he actually is with such crass material. I just don't think Murd is wired that way. He's a good soldier and sits through it, but Uncle Sal's schtick probably isn't his cup of tea (as it's not mine, either). Oh, I've heard Murd say some pretty crass things before, but I understand your point (which was basically made to say you don't like the Uncle Sal shows again?). It's a point well-taken and it's been said before by a few others. Not everyone likes Sal's style of chatting, but a lot of us do, Pants does, Shane apparently does, and I think Bryan and Peter did too that's why he's on the show every six months or so. 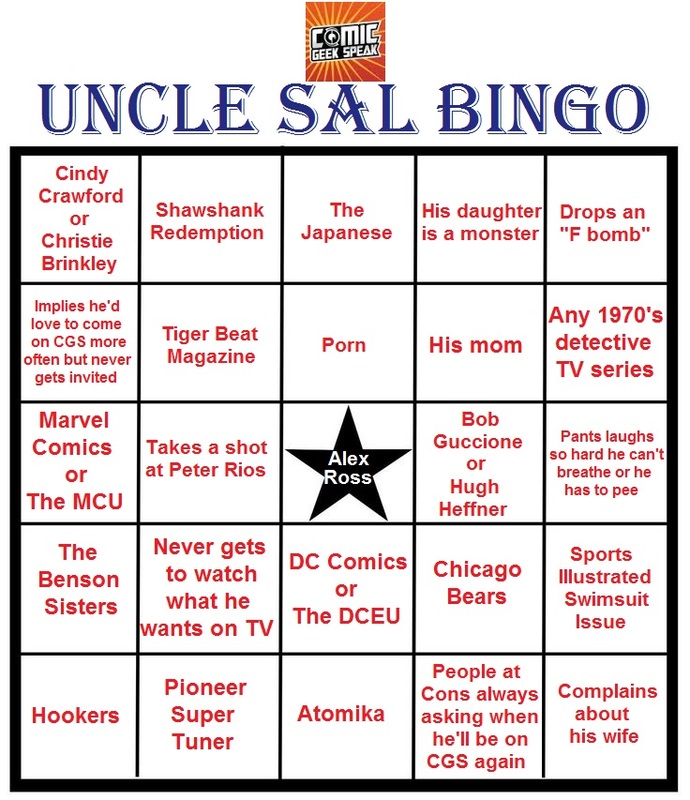 Haha...I think with most Uncle Sal episodes you'd probably get a completely full board if you used that one! From Sal's Facebook during his family trip to Disney! "Karen and I last night after we left the kids with the babysitting service at Disney world." This scene is from It's a Mad, Mad, Mad, Mad, Mad, Mad World! Did I get all the "Mad's"?